Kerala has about 30% of its land cover accounted by forests. The forests of Kerala are famous for elephants and tigers. Also there are a lot of animals are there like sambar, deer and wild buffalos. Periyar Wild Life Sanctuary, Parambikulam Wild Life Sanctuary, Eravikulam National Park are the major Wild Life centers. Kumarakom, Thattekad, Myladumpara are the main Bird watching centers. The major tourist activities that can be undertaken in the wild life parks are wild life tours. One can really feel the smell of an Elephant in these tours. Elephant rides, staying at jungle lodges, tree houses, fishing camps etc. are other facilities available there. Guides are available in the Periyar Wild Life Sanctuary for treks in the forest. The Parambikulam forest authorities organize wild life tours in the park. In Kerala one can see elephants in the streets. 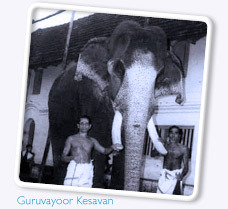 Elephants are used for lot of activities in Kerala like Temple Processions, lifting heavy timber trees and woods. Elephants have always found a place in the life of the Keralites. No Temple festivals are completed without an Elephant. They are loved and well cared by the people of Kerala. Certain organizations like the forest department which own elephants, enroll them as employees. are an integral part of the daily life in Kerala, south India. These Indian elephants are loved, revered, groomed and given a prestigious place in the state's culture scape. Elephants in Kerala are often referred to as the 'sons of the sahya.' The Elephants are used for religious ceremonies in and around the temples. A few elephants work at timber yards.